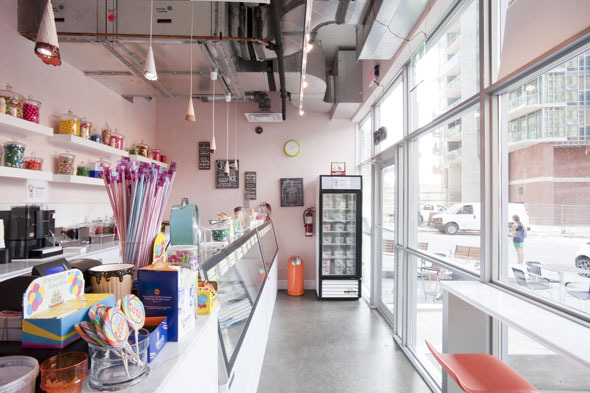 The Perfect Scoop Ice Cream Shop opened its doors in early August, dishing out Kawartha Dairy ice cream forLiberty Village residents and workers. As I biked around condo buildings and construction sites to go check it out (a tad lost, I’ll admit), the sounds of Katy Perry’s “California Gurls” playing on outdoor speakers could only mean one thing: an ice cream shop was just around the corner. Owner Anthony Sansoni warmly greets me on the patio and, despite my urge to immediately grab a cone, we first chat about his new business. 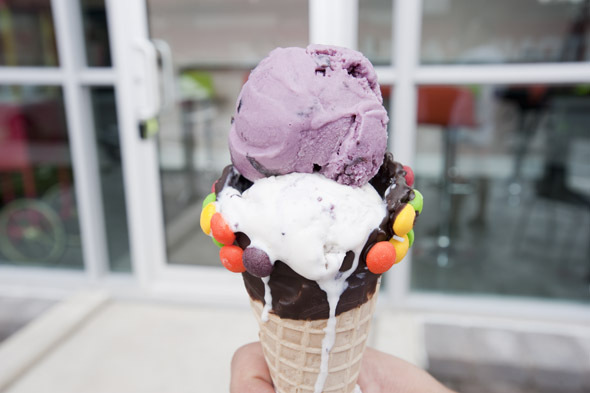 Sansoni’s reason for opening an ice cream place is simple: “I grew up around ice cream. I love ice cream. Ice cream’s fun.” His main business is operating tanning salons, and he’ll be opening one in Liberty Village soon. But he wanted to try something new, and thought the area needed a quality ice cream shop. When it came to selecting an ice cream provider, the choice was easy. Sansoni’s grandma owns a cottage in the Kawartha Lakes region, and he’s been enjoying Kawartha Dairy’s goods on weekend cottage trips his entire life. Plus, he explains, “It’s the best. It’s the highest quality. People love how rich it is.” Having enjoyed Kawartha Dairy ice cream many a time, I wouldn’t disagree. The Perfect Scoop sells a wide range of Kawartha Dairy’s ice cream, sherbet and frozen yogurt flavours — over 40 are listed on the website — including gluten-free, sugar-free and dairy-free options. A hefty single scoop costs $3.75, and a double goes for $4.25. For a bit extra, you can enjoy your ice cream in a sugar or waffle cone, or if you’re feeling especially indulgent, you can treat yourself to a pretzel or chocolate chip cookie cone ($5.95 for a single scoop and $6.95 for a double). If you’re just looking for a little ice cream fix, on the other hand, there’s the “teenie weenie” size, about a few generous spoonfuls, for $1.25. As cute as the teenie weenie cone is, I’m no ice cream amateur, and want a full scoop. I don’t resist Sansoni’s enthusiasm for pleasing customers and offering samples, and I try a few of the cottage country-themed flavours like Wolf Paws, Bear Claw, and Moose Tracks. I finally settle on a tried-and-true favourite, Kodiak Island Fudge. It’s better than I remember from my visit to the Kawartha Dairy stand in Bobcaygeon last summer. Creamy vanilla ice cream provides the base for rich chocolate chips and ribbons of decadent fudge–the perfect balance of vanilla and chocolate flavours. Compared to the ice cream, however, the cookie cone isn’t very noteworthy and, in my opinion, not needed with ice cream this indulgent. Sitting atop one of the eight or so stool seats, I enjoy my cone while taking in the unabashedly cheerful atmosphere. 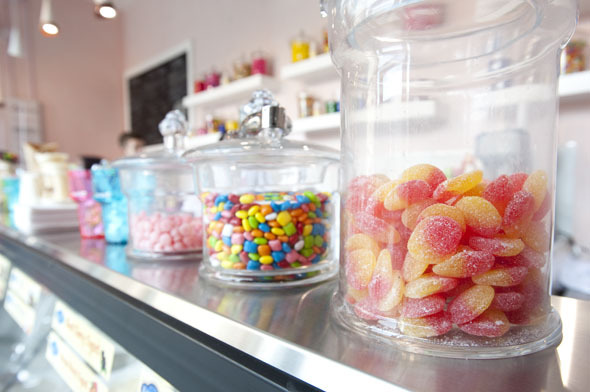 The shop is adorned with a rainbow of candy-filled glass jars, ice cream cone light fixtures, and neon coloured accents. Posters with cute sayings like “keep calm and eat a cupcake” dress the walls, while a pop radio station plays inside and over the outdoor seating area. However, true to the neighbourhood’s style, the shop includes some industrial touches, like exposed ducts, to balance the sugary sweet décor. 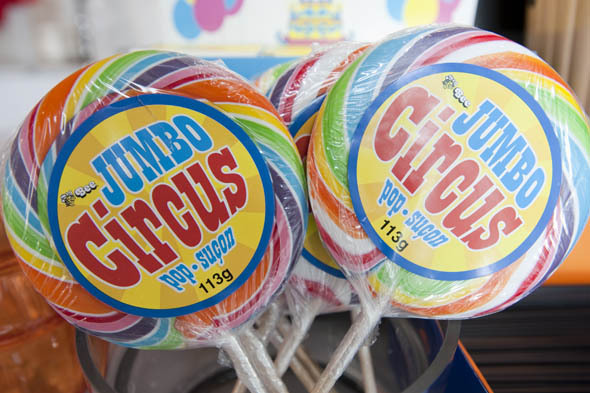 On a cloudy afternoon, some ice cream and colourful surroundings are the perfect pick-me-up. 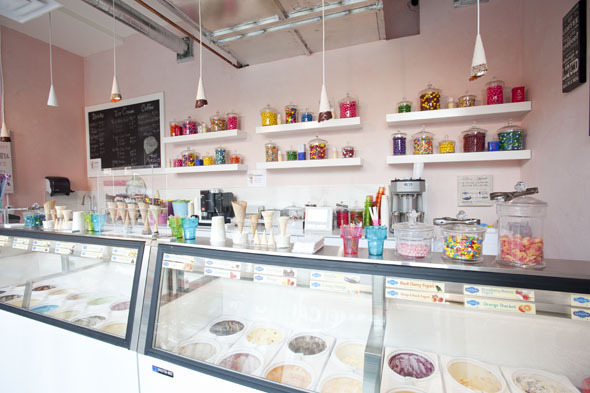 The Perfect Scoop also sells milkshakes, espresso drinks, assorted cold beverages, and 1.5L tubs of ice cream for $13. There are plans for additional offerings in the future, like smoothies, ice cream cakes, and ice cream sandwiches made with freshly baked cookies and waffles. Wi-Fi is also on the way. As a soon-to-be resident of the area, Sansoni hopes to provide community members a place where they can get out of their condo and indulge their inner child: “I feel like a kid in the store. I love ice cream. I hope everyone can enjoy it as much as I do.” With a wide selection of flavours and options for different dietary needs, it’s hard to imagine who wouldn’t enjoy visiting this friendly ice cream shop. 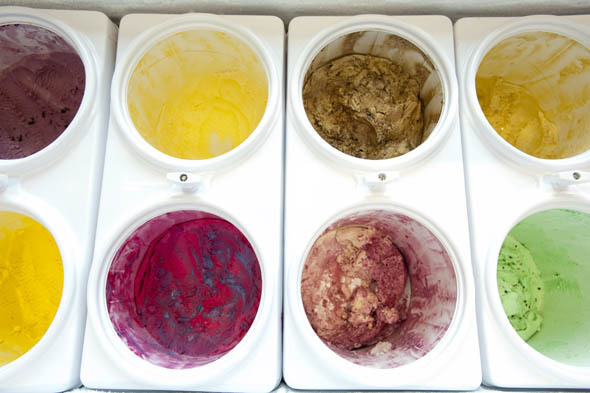 The Perfect Scoop is open Monday to Wednesday 12-10, Thursday and Friday 12-11, and Saturday and Sunday 11-11, but hours may change in the winter.